← Gallup: Americans Still Believe! Indeed, over the centuries Biblical commentators have parsed poetic verses by comparing the subtle differences between the first and second halves of a given couplet. In the case of this famous verse, the juxtaposition of Jacob with his “alter ego” Israel has given rise to some rich homiletical interpretation. In this synechdoche, the patriarch symbolizes the whole. Jacob is the earthly, embodied side of the patriarch, the aspect that inhabits physical spaces. Israel is the other side of the coin, the part of the patriarch which wrestled with the angel of God and came away blessed. Where Jacob has tents, Israel has dwellings — in Hebrew, Israel has mishkanot, like the holy dwelling-place of the indwelling Shekhinah. Each of us is both Jacob and Israel; we have Jacob-ness and Israel-ness in ourselves. And each of us can make the leap from inhabiting a tent to inhabiting a dwelling-place. When we wrestle and dance and dream with Torah, we transform ourselves from worldly Jacob to engaged Israel, and we embody Balaam’s blessing. 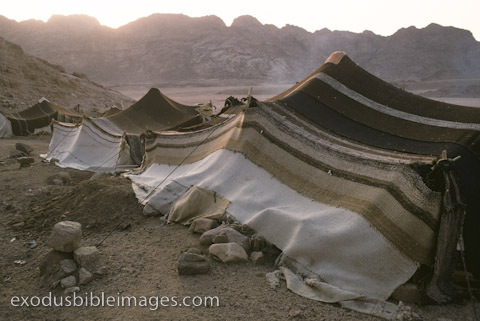 For my part, I find myself returning to the image of Jacob as “wanderer.” In his childhood, he is described as “ish tam yoshev ohalim” – “a simple man who dwelt in tents.” (Genesis 25:27) Tents are by their nature temporary dwellings; and indeed Jacob will eventually spend most of his life wandering/fleeing/returning/departing. As Reb Rachel points out, both Jacob and Israel are indelibly imprinted upon our spiritual psyches. We are forever setting out and we are forever coming home – life is an endless cycle of wandering and homecoming. And so it must be: if it were exclusively the former, we’d be eternally lost; if only the latter, our spiritual lives would become complacent and stagnant. Here, then, is yet another way to understand Balaam’s blessing: that we may experience the divine presence in our going forth and in our coming home. Never knew this explanation before, but I think it’s significant that all my dreams have always been about travelling. Railroad tracks, especially, and stations. But I have been blessed so far that the destinations have been pleasant. Going out and coming home! I like that.